paulacoomer July 4, 2016 balance, life philosophy, western U.S.
My father used to tell me about a warning in the Bible, a prophecy, about how, near the coming of the end of the world, human travel would increase. This was supposed to happen prior to Christ’s second return. He saw the ease of modern travel—airplanes, specifically—as an indication that Jesus was soon to appear on Earth again. As I’ve grown older, I’ve come to consider much of the Bible to be beautiful metaphor, a guide to living and a history that requires deciphering, such that to me, the interpretation of this prediction might have to do with the way we tend to develop the urge to see the world as we grow closer to the end of our own lives. I may be entirely wrong about that, and I certainly don’t mean to shadow or excoriate anyone else’s beliefs. Maybe Jesus is still one day going to revisit us, but I’ve always just assumed that if he did, he’d be pretty pissed off about the bloodshed and hysteria that have been cultivated in his name and would arrive on the scene to chastise us all for being so narrow-minded. I hope I’m nowhere close to the closing of my existence on this planet, but I have to admit to experiencing in recent years an enormous increase in my appetite for going places. In fact, I can remember a day in Chicago eleven or so years ago as I was passing through a turnstile at O’Hare, on my way to catch the L, experiencing something like an epiphany having to do with leaving hearth and home and dependability and respectability in exchange for freedom of movement and my own brand of living. At the time that involved accepting a job touring the country to review early childhood education programs for the federal government, leaving academia behind. A position that dissolved almost as soon as it was offered, thanks to our old buddy G.W. Bush, and, in fact, did not re-materialize until years later, turning out to be very, very part time at best. A bad situation, let me tell you, as I had already resigned my academic teaching position and was forced to dip into my retirement fund to pay the rent. Within two years, I went groveling back to my university, broke, having sold everything I had of value, but with a big fat stack of pages with a title page that read: Jagged Edge of the Sky. I lasted 7 years in the next go around as an instructor of writing at the same university before I reached the point that another book was about to blow my head off. In between I wrote two more, helped some nice folks try to start a small college, watched a passel of grandchildren come into the world. This time I was smart enough in the interim to reel in a husband (AKA Phil) with a nice career and a pension, one who said, when I brought up the possibility of leaving academia for good because it was clearly ripping me into shreds thanks to the shear volume of work, and thanks to the fact that I had grown increasingly unhappy with spending the precious moments of my life grading undergraduate writing. Not that young students aren’t deserving, but, well, a person can only take so much of exhorting twenty-somethings to turn off their cell phones and come to life in the classroom, or of living as an indentured servant, which is what teaching writing in the U.S. at the undergraduate level is. Think: no personal raises in more than a decade. Think: 70-80 hours of work per week at less than $35,000 a year. Think: an average of 5,000 pages of writing to read and respond to per semester on top of class prep and other service-to-the-university requirements. Think: living on coffee, liquidation store food, and cans of tuna to make ends meet. Add a 2-hour daily commute on top of that, and you’ve got a recipe for physical disaster, which is pretty much where I had landed. I’m still trying to get on top of my health, to repair the damage done by 20 years of sedentary living and bad habits. Which brings me around again to travel and my most recent trip to my Chinese medicine doctor in Reno, who is working miracles on me, increment by increment. Which brings me to the vacation from which Phil and I just returned, and the bristlecone pines. 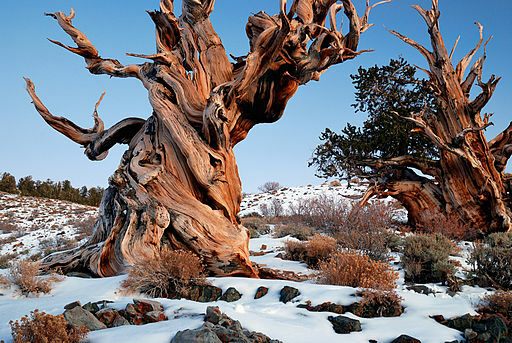 Bristlecone pines are the oldest living organisms on the planet. They grow in a very few high-elevation places in the U.S. southwest, the White Mountains of California among them. They are very distinctive in that they are one of the few organisms that can grow in the rather unfriendly dolomite soil found at 11,000 feet; they can continue to grow if they only have a single small strip of bark running from ground to branch; they are dormant nine months out of the year (it takes 100-200 years for their trunks to gain an inch in diameter) and they do not decompose—which means some of the trunks lounging on the ground have been there almost since California’s last ice age, which ended 12,000 years ago. Let me assure you: walking through a forest comprised of ghostly entities 10,000 years old has a profound effect on personal perspective. Touching them makes you feel rather spoiled and teensy and insignificant, makes you understand how feeble we humans are at persevering, makes you see distinct value in sticking it out when the going gets tough. Other impressive characteristics of the bristlecone include the funny little cones they put out, which look rather like fetal porcupines. To balance this unfriendliness, the needles of the tree are soft and inviting. To run your hand along a branch is to desire to be embraced by them, to roll in them, to drape yourself in their silkiness, to hold them to your cheek. Lastly, the bristlecones almost never give up, never let go of parts that are no longer serving them. They hold onto the past. What contrast to what we humans in American culture are taught. The forest at Schulman Grove in the White Mountains of California is full of trees that look half dead, but, in truth, they are supporting the parts that are still alive. Enormous sections may no longer produce those sensuous needles and unfriendly cones, but those un-alive sections don’t fall away because they still serve the tree. The ancestor upholds the child. Lately I’ve been reading a book called The Web That Has No Weaver by Ted Kaptchuk. It is an attempt to help the Western mind understand Chinese medicine. I believe the bristlecones and the Chinese theory of health and life and the human body are parallel. The bristlecone understands the balance between being alive and not alive, that Qi never departs the organism. It may lessen, but it doesn’t entirely vanish. It remains part of the whole, understands itself as an entirety, owning and being affected by all that has happened to it. It understands that what occurs in its lifetime is a record stored in its physical being. It understands that its history matters, is dependent upon it. It understands that to persevere is the only goal, despite the circumstances it was born to. I have failed at this last part. I have always succumbed to circumstances, in fact have made a habit of pulling up roots and running when the going gets tough, putting importance on all the wrong things, including distancing myself from family. This stress is bearing out on my body as I age. I’ve suffered too many shocks, am wearing out just a tad earlier than my age might predict thanks to faulty coping mechanisms and a failure to just chill out and accept that things are as they should be. I’ve always thought that change is good, that uprooting is the best way to promote my own growth, that re-invention was the key to survival. The bristlecones awakened a new notion in me, that there is growth to be had no matter your circumstances, that there is as much to be learned and gained by being stationary as there is from galavanting around the globe, that perhaps true wisdom and growth arises from what we Americans might call boredom. That boredom might be solved by turning inward, becoming dormant for a period of time. I suppose I could have just made an appointment with some Western medicine doctor who would be happy to eat up my insurance allotment, but one of the reasons I ran from nursing is that Western biomedicine concepts and precepts never resonated with me. I see science as being fickle and faulty, changing with the wind, and much too in love with money. We now know, thanks to the discovery of Otzi the Ice Man in France some years ago, that Chinese medicine and acupuncture may be at least more than 5,000 years old. The wisdom passed down through those many ages of practitioners is helping me to re-examine life and my existence and my relationship to the whole from top to bottom, including my at times distressing history, is helping me to understand the difference between restoration and curing. Restoration requires a commitment, requires embracing the value of steadfastness, recognizing that we are each part of the whole, that Qi runs from the bristlecone pine to the tiniest micro-organism in the sea. To bring me to center and to health is to take all of them on the journey with me. That feels like a tremendous responsibility, one I can’t run away from. Not too far a stretch to see acupuncture needles in the spines of the bristlecone’s cute little offspring. Doesn’t mean I have to give up my love for taking trips, but I can see where it might mean that instead of running from unfriendly conditions, I might have once in a while decided to stay rooted in place, to “face the monster,” as Dad use to say. In the words of my Chinese medicine doctor, I can’t do anything about my life, but I can claim and embrace my own history, the mistakes, the trials, and the storms, see them as part of what has ultimately made me whole. A strong tree perseveres through winds and harsh seasons. Nothing wrong with sinking roots deep and committing to a purpose. Death will find us, whether it has to chase us down or climb to whatever peak we’re refusing to depart. Travelling, to a tree, is the pleasure of moving with the rhythm of a breeze.